When the new Karbala International Stadium opened almost exactly two years ago, the first game saw stands packed beyond capacity. Last year in June the first international friendly at the giant Basrah International Stadium was sold out and packed once more, just as was this February's friendly against Saudi Arabia. High-profile games in Iraq continue to draw immense crowds, showing how the nation is returning to normal life after years of turmoil. Now, just 70 km south of Karbala they had one more chance. 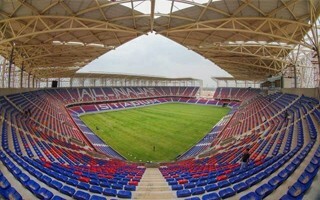 Last Saturday Al Najaf Stadium opened its doors. Local Al Najaf FC took on the Iraqi national team and it wasn't just packed. While the nominal capacity is 30,000, the actual attendance was reported closer to 40,000. With the sports minister Abdul-Hussein Abtaan in attendance and a special opening ceremony, it was a truly special occasion. After all, construction of this stadium began back on May 22, 2011 and – after very difficult deadlock – is finally being delivered now. We won't say “was delivered”, because there's still considerable amount of work to be done. But it's operational, which is a cause for celebration itself. The main stadium, designed by American company HOK, is being covered with openwork panels that provide both the right amount of shade and ventilation to spectators on the concourse level and truly charming decoration with traditional islamic patterns. 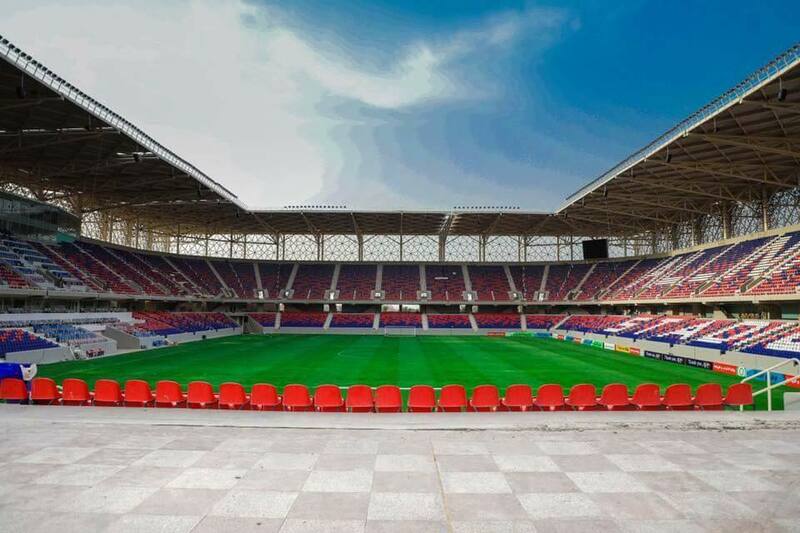 It has an opening in the south, becoming a gate that leads towards the secondary stadium (2,000 seats) and public plaza, still being prepared. Even if not ready, looking at it now makes you forget the difficult history of the stadium. After all, construction was due to end in 2014, but effectively came to a halt by late 2012. Economic crisis and war spilling from Syria meant serious issues and works were only restarted in 2015. We're not even certain how much the stadium consumed in the end. It was initially hoped to cost $83.75 million, but minister Abtaan confirmed recently that only over the past 3 years some IQD 106 billion were spent, representing over $90 million at present.